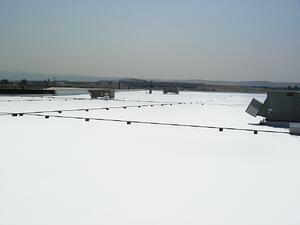 National Coatings offers several roof systems for all your roofing needs. From new construction to roof restoration and maintenance systems we’ve got you covered with a seamless, watertight, energy efficient roofing solution. We offer monolithic acrylic, silicone and spray polyurethane (SPF) roofing systems that are excellent over asphalts, single-plies, concrete, metal and SPF roofing. National Coatings prides themselves in providing excellent customer service to all of our cliental. This includes highly trained sales representatives, customer services agents, technical roof representatives, and a stringent approval process to become a National Coatings Approved Applicator. We have representatives located in every state across the nation, as well as, several international locations to provide you with the best solutions to your roofing needs. Click here to find a Commercial Sales Representative in your area!